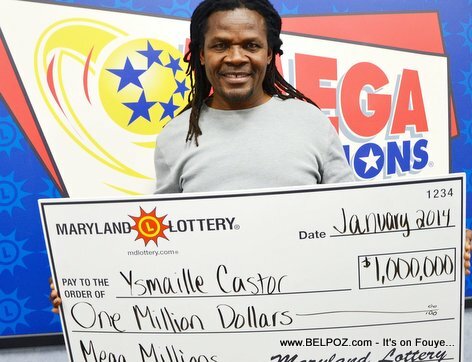 Imagine that... Ysmaille Castor, a Haitian bus driver in Maryland, finds an old Mega Millions ticket from last year under his microwave... He decides to play the numbers again... He wins... 1 Million dollars US... What an amazing story!!! Ysmaille took the lump sum option, he wil be receiving about $662,500 after taxes. I remember, while living in New York, there used to be this NY State lotery ad that says: "All you need is a Dollar and a dream..."
Congratulations Ysmaille Castor on your winnings... If you are one of newsletter readers, I need about 15,000 dollars to pay off my debts... Bless me... Will you? « WOW... Sean Penn's Haiti Earthquake Camp is No More? However, in this case, it is a Haitian in the news for all the right reasons. I can only be happy for this hardworking man.